Conversing about intense, real life situations can aid in the learning of a new language. While text books and formatted study programs can become dry, there is something about discussing personal adventures that seems to stimulate absurd sentences and aid the memory in unique ways. Take my recent experience in crocodile territory, for instance. During my subsequent Chinese lesson, we came up with all kinds of laughable sentences that helped me grasp sentence structure that had evaded me before. And, whereas talking about the crocodile eating me in my native tongue was horribly distressing, talking about it in Chinese relieved tension because I was learning something in the process and playing with word order. 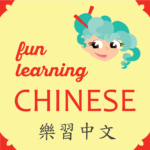 Word order in Chinese is especially important because of the lack of tenses in verbs. So, the first part of a sentence needs to indicate “when” something is happening, if that information is going to be relayed at all. Such order is also very important for conveying the subject and object involved, that is, who (subject noun) is doing what to whom/what (object noun of action). But even in the Chinese language, they have ways to mix up word order IF you use the correct word/character signals first. Thus, learning to discuss whether I was eating the crocodile or the crocodile was eating me, was great fun. And in the process, I came up with the idea of making a purse out of the crocodile. First, some vocabulary to tune your ear to the sentences. 真幸運 ㄓㄣ ㄒㄧㄥˋ ㄩㄣˋ (zhēn xìng yùn) really lucky! When I was talking to my tutor about our crocodile hunt, one thing lead to another and we made the following sentence. Unfortunately, I have been eaten by a crocodile. Which obviously isn’t true. And neither is the next sentence, and I have no plans to make it true. It is indeed fortunate! I ate the crocodile. But who knows if the next sentence will ever be true. I am thinking of buying a crocodile leather purse, because it will make me feel formidable. If you read the story I linked to, you know that the following IS true. My husband spent four hours looking for a crocodile. Yesterday afternoon, from 1:00 until 5:00 we were continuously hunting crocodile. I think for me to eat the crocodile is better (gooder) than for the crocodile to eat me. If you have looked a crocodile in the eyes, which I have, you know the next 2 sentences are true. The crocodile is not afraid of us. They think to eat us. And there you have it. 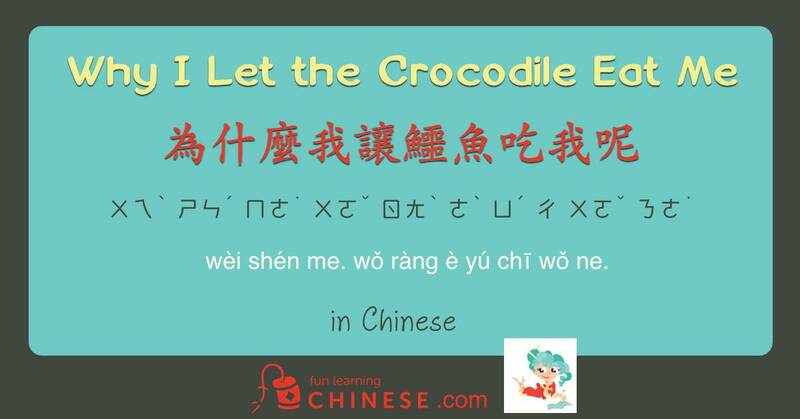 Some of my therapy to recover from the emotional trauma of my crocodile hunt was put to good use learning Chinese sentence structure. I cannot say I am sorry for the crocodiles I have hunted and killed during the process. Maybe next week, spiders? ❶ 幸 is the same character used in this word for happiness: 幸福. This implies that happiness is not just an attitude, but can be enhanced if favor or “luck” enhance your life. ❹ I think it is entertaining that the same character means both flower and to spend. ❺ In Chinese, there is no separate word meaning better.